OPNFV Training is here! Learn the fundamentals of OPNFV and how it can help accelerate your Network Functions Virtualization (NFV) transformation. The OPNFV Verification Program (OVP) is an open source, community-led compliance and verification program for commercial NFV products and services. OPNFV is a vibrant and diverse community comprising an overlapping tapestry of developers, members, end users, upstream communities, commercial suppliers, and academia–all collaborating to make NFV a reality. Open source collaboration means working side-by-side with end users to ensure applicability to real-world networks and challenges. Many of the principal contributors to OPNFV are from companies running large scale networks themselves. Through automated deployment tools, robust Continuous Integration/Continuous Deployment capabilities, and global test infrastructure, OPNFV enables developer collaboration and rapid iteration across the cloud, SDN, and cloud ecosystems. By integrating industry standards with existing open source building blocks, OPNFV provides a set of scenarios that accelerates time to market for development and deployment of NFV. Network operators today are demanding flexibility across all hardware and software stacks. 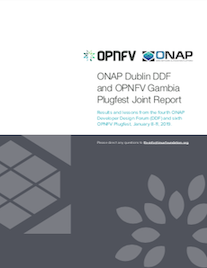 OPNFV is working to ensure interoperability in deployment, network integration, and VNF applications. Today’s networks must meet stringent needs around security, scalability, uptime, throughput, ease of network provisioning, configuration, and orchestration. OPNFV can be woven into the fabric of any network and operate at scale.